Amending soil and mulching are two different practices, but they relate to one another closely and an understanding of both is necessary for proper application. A soil amendment is any material added to a soil to improve its physical properties, such as water retention, permeability, water infiltration, drainage, aeration, pH and structure. The goal is to provide a better environment for roots. In preparation for planting an amendment should be thoroughly mixed into the soil. In areas where plants will not be planted for several months merely burying organic amendments can be effective because they have time to decompose and be converted into usable plant nutrients by earthworms and microorganisms. being buried. The general purposes of mulch are to reduce evaporation and runoff, inhibit weed growth and create an attractive appearance, but mulch also does some important soil amending over time. In addition to these benefits, mulch also buffers soil temperature, keeping soils warmer in spring and cooler in summer. Rake back mulch from plants in early spring to allow soil to warm more quickly and after excessive rain to allow soil to drain more quickly. To answer this question precisely, the soil must be tested to know the nutrient and organic content. Your goal should be to start with a balanced soil that has an organic content of around 3%. Fully composted organic matter is fertilizer ready to be used by plants for nutrients. 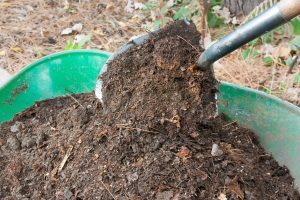 If you are able to come by this rich compost only one inch on the surface of the soil as a mulch, or worked in to the soil as an amendment is needed. Most compost is not fully decomposed and has an organic content of 45-60%. In soils that have organic contents of less than one percent, around 10% by soil weight is a typical target of a proposed soil amendment if compost is to be used exclusively. 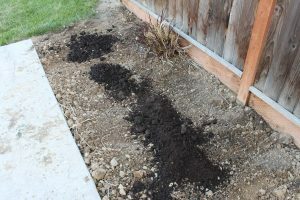 As a general rule, a 2-to-1 ratio of existing soil to compost, by loose volume, will achieve the desired organics level. If other less decomposed materials are used, less is needed to achieve the desired organic content, but supplemental organic fertilizer like kelp and fish emulsion may be needed early in the season to bridge the gap while the organic matter is being decomposed by earthworms and soil microorganisms. These microorganisms will actually use nitrogen along with the plants as part of the decomposition process, but the nitrogen will be returned to the soil over time. Consider using shredded newspaper and grass clippings as part of your mulching. Newspaper works well for keeping soil cool and suppressing weeds and grass clippings are a great source of nitrogen. In amending soil to this balanced organic level it is best to have a balance between quick improvement and long lasting improvement and this is also true of mulching. Grass clippings and partially composted manures provide rapid decomposition, most compost provides moderate decomposition and materials such as wood chips, bark and peat are slow to decompose. For mulching, a small amount of rapid and moderate decomposing substances is needed, one inch or so and this can be mixed with a larger amount, three to four inches of slow to decompose mulch. The rapid and moderate decomposing materials will also act as a catalyst increasing microbe activity and speeding up the process of decomposition of the mulch. Where it is best to start with soil that has been amended to the correct organic content and hopefully the correct pH, the above mulching process, if applied consistently when needed will eventually amend even unbalanced soil. How often this mulching process will need to be repeated depends on your individual climate and soil conditions. Between corps the thin partially composted mulch layer can be worked into the soil or removed to the compost pit and a new thick layer of mulch applied. For some soft stemmed plants and vegetables apply a small amount of fine gravel to mulch close to the plants and keep organic mulch a few inches away from the stems. Early in the season, when earthworms and microorganisms are just beginning to break down organic matter into usable nutrients for plants. In spring and fall, when soil temperatures are low and the biological processes that release nutrients from organic matter slows down. In early spring to help awaken plants that have been overwintered. When wood chips or sawdust have been used to amend the soil without the addition of enough nutrient rich compost. Toward the end of the summer season to give an added boost to heavy feeding plants that are still producing. By using these amending and mulching guidelines you will be well on your way to producing rich organic biologically active soil for your gardens. Nick Fraser is a Garden & Greenhouse contributing editor. What Type of Mulch is Best?